Red Wing Software recently underwent the process of shooting a video for its business accounting software, CenterPoint Accounting. We are extremely grateful to the businesses that helped out by letting us shoot video footage at their facilities! CenterPoint Accounting can handle the needs of a great many different business types, and we wanted to show that in the video. We were fortunate to have found four very different businesses that allowed us to film their facilities and employees for the video. We would like to offer our sincere thanks to them! Here’s a shout out about each one of their businesses. Pepin Manufacturing, Inc. (PMI) is rapidly expanding, award-winning manufacturing facility in Lake City, Minnesota. In business since 1993, PMI manufactures a wide range of products ranging from medical electrodes to medical device components, lint rollers, and even their own Marfree™ Urethane. A large part of PMI’s business includes custom contract converting/fabrication. For more information about PMI, please visit: www.pepinmfg.com, or call 1-800-291-6505. The Smokin’ Oak is a restaurant in Red Wing, Minnesota that specializes in wood-fired cooking. They offer catering and private parties, too. Some of the Smokin’ Oak’s delicious menu items include rotisserie and BBQ chicken, ribs, brisket, prime rib, and even their very own wood-fired pizzas. Be sure to stop by the Smokin’ Oak if you are in Red Wing! To view their entire menu or for more information, please visit: www.thesmokinoak.com. Based in Hager City, Wisconsin, Knudsen Trucking is a 48 state common carrier with full authority. 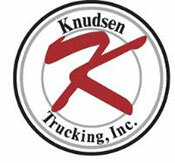 Knudsen Trucking is a family-based company in business since 1964. They currently ship in excess of 60 loads per week, to the Midwest, East, and Southeast. For more information, please visit www.knudsentruckinginc.com. 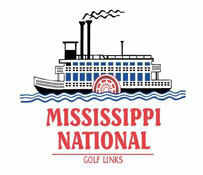 Mississippi National Golf Links is a 36-Hole golf course in Red Wing, Minnesota. Composed of the beautiful Highlands and Lowlands, Mississippi National Golf Links offers beautiful views of Red Wing and an exceptional golfing experience. For more information, visit www.golfredwing.com. The new CenterPoint Accounting video will be done soon, and we will share it as soon as possible. Thanks again to these businesses for being a part of our product video! I recently attended a festival at the local airport, where people from around the world displayed their artistic talents. I wanted to share one of the many photos I took, as they had just uncrated this beautiful carving of a Pelican standing on a piling. 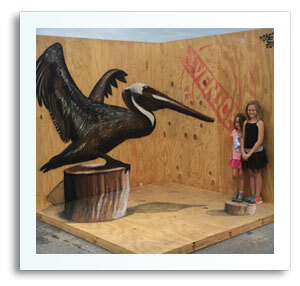 I had to take the photo from just the right angle so-as to hide the fact that everything in the photo, with the exception of the two young ladies on the right that appear to be standing on a stump, is actually painted on the flat surfaces of plywood. I wanted to share this example of something that appears to be one thing if it is looked at from one specific angle when, in realty, it is something totally different if viewed from another perspective. When you analyze the information in your business, make sure that you look at it from more than just the one angle that makes it appear to be how you want it to appear. On behalf of Red Wing Software, I want to thank all the brave men and women that are dedicated to keeping us safe and free. This is a special time of year for many people around the world. Merry Christmas, Happy Hanukkah, and a prosperous New Year to our customers, employees, partners, and suppliers.